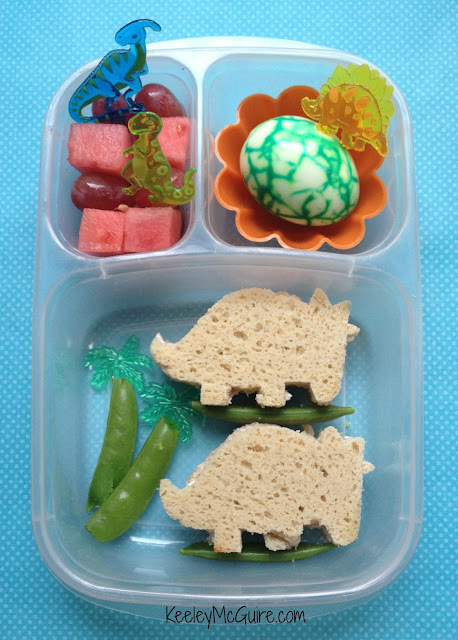 Gluten Free & Allergy Friendly: Lunch Made Easy: MOMables Monday is DINO-MITE! 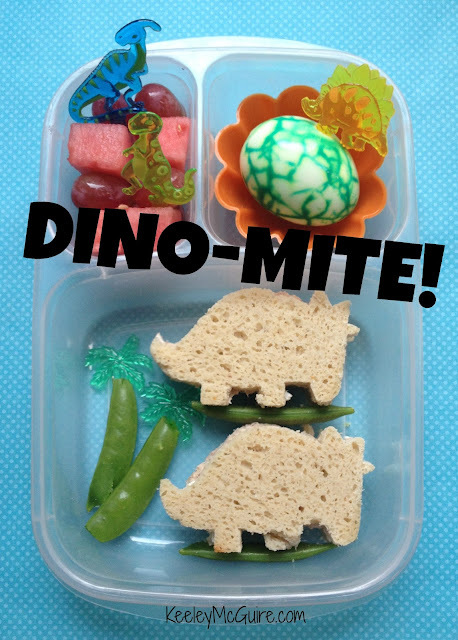 Lunch Made Easy: MOMables Monday is DINO-MITE! I purchased this dinosaur sandwich cutter at Target a few months ago, so it was about time I used the sucker! Plus, it being MOMables Monday, I know it would make this school lunch DINO-MITE! In case you aren't a MOMables subscriber, these dino sandwiches on gluten free bread are the MOMables "Picky-Kid" Menu Item. Little Miss also has snap pea trees and additional snap peas under each of her dinosaur sandwiches. Top left are watermelon dices and red seedless grapes with fun dinosaur picks. Top right is a "Dinosaur Egg". I made the dino egg using the tie-dye method I've done before (click here to see). The egg also has a dinosaur pick for added fun. So cute! But, I cannot look at that picture without hearing J.J. from Good Times yell it out. Very cute! We love that cutter too. Dino-mite indeed! Way to go, and love the egg idea. Good protein for roaring little zoologists!